I'm so sorry, but I totally lost track of the days last week. I remembered late last night that I forgot to announce a winner for the free September Craft Project Central subscription on Saturday. I do have a winner, and it's RuthK! Ruth, I hope you see this post, because I have no way of getting in touch with you. It looks like you don't have a blogger profile like most of the others who left comments do. If I don't hear back from you by Thursday, I'll have to give the subscription to someone else. I also have another September Craft Project Central project to share with you. I really love the framed art on this one. 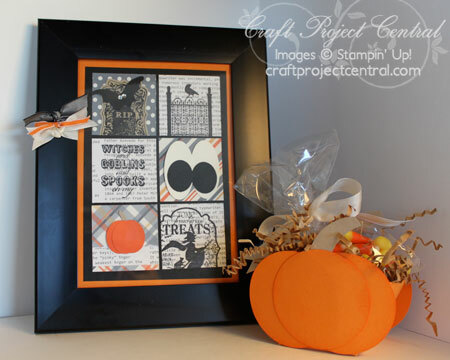 This VERY cute Halloween project was designed by Julie Beltramo. If you would like to learn how to make this great project, you'll want to subscribe for the month of September. With your subscription, you'll get illustrated, step-by-step instructions for 10 wonderful projects for only $10! You can find out how to gain access to a bonus eleventh project over at Craft Project Central. Please leave a comment for Julie to let her know how great her project is, too!